There's no great fix for the iPhone 4 reception issues right now. Here are the best pseudo-solutions so far. Depending on how you hold your iPhone 4 during calls you may or may not notice your reception drop. Some haven't seen it at all, but many of our readers and our staff have definitely experienced it while browsing, emailing or using apps. We think it has a bit to do with your initial reception and people in stronger coverage areas are affected less. But we're also pretty sure—and Apple confirms it—that touching the antenna does affect things—whether or not it has the final result of killing calls or speed of data connection. Gripping any mobile phone will result in some attenuation of its antenna performance, with certain places being worse than others depending on the placement of the antennas. This is a fact of life for every wireless phone. With our past devices, the antenna performance when the phone was held in a certain way didn't seem to be an issue or stand out in particular. But with the iPhone 4 we're definitely seeing an effect, particularly when using data or tapping away on our on-screen keyboards. If you ever experience this on your iPhone 4, avoid gripping it in the lower left corner in a way that covers both sides of the black strip in the metal band. This explanation does fit with the user reports we've received, but the solution isn't exactly comfortable. It's awkward to avoid touching the antenna points on the iPhone—especially because the glass on the phone's back and front is extremely slippery. The bottom portion of the phone just seems like a natural place to hold the iPhone 4 in order to avoid dropping the gadget. The additional problem is that when you hold a phone for data usage—browsing or apps or email—you're going to almost have to touch the bottom and sides at the same time. Especially in landscape mode. This is a major problem for smartphones. Apple offers a $30 "Bumper" case which covers the edges of your iPhone 4—including those sneaky, evil antenna points—and protects it from reception issues and glass-shattering bumps. This case is not the most appealing of solutions as it not only covers part of your iPhone's gorgeous design, but also interferes with the usage of third-party docks and charging cables. It's also a $30 dollar rubber band meant to fix the problem that was engineered into the phone—which could be something you'd be against buying, on principle. So far the most attractive pseudo-solution for the reception issues appears to be a third-party skin like StealthArmor. Such a skin protects your iPhone from scratches and provides a barrier between your fingers and the antenna points. You can expect to shell out $25-$45 for such a skin. Aside from skins, there are plenty of plain old third-party iPhone 4 cases that will cover the edges of your device just as well, but will also hide more of your device's pretty looks while at it. One of our readers was inspired by his one-year-old to just plain figure out a way to avoid touching his phone too much. Brian's Frankenstein-style solution isn't exactly too attractive or easy to stick in your pocket, but it would do if you're really desperate and happen to have a trinket with a suction cup sitting around. 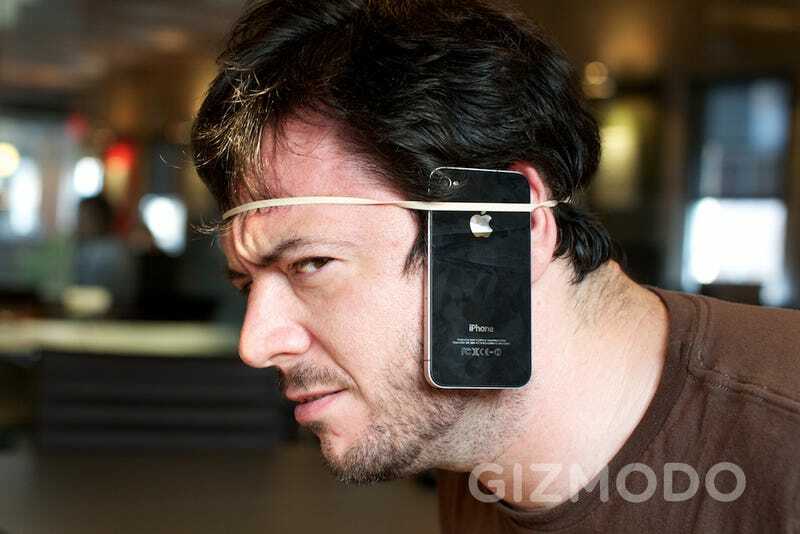 Some folks report that they've successfully rid themselves of reception issues by wrapping a rubber band or wristband around their iPhones. It's not exactly a great solution as you have to cut holes into the band in order to access the charging port or volume-toggle—not to mention that all your buttons are constantly pressed down. It's a cheap solution though and simple enough to use in a pinch. Just be careful that you don't accidentally fling your iPhone across your room like I did while trying testing the solution. If cases and rubber bands are to expensive for you, there's always the cheap man's solution: Tape. From the sounds of it the results are a mixed bag, but there are a few users who claim that a small bit of tape over their iPhones' antenna points fixed any reception issues. For what it's worth, Brian Lam tried it with masking tape to no effect. Remember that something like duct tape is sure to leave a residue on your phone, so mind the heavy, gummy tapes with strong adhesives. I've yet to see how the results look, but I have heard of one user successfully "fixing" his iPhone with a dab of clear nail polish over the antenna points. I'm not certain how easily the polish will be rubbed off that edge or if simply using a chip-resistant variety is the trick. Considering how few people have tried this and what a small percentage of them have said it works, this doesn't seem like the best option. Just Don't Touch It With Your Hands! If all else fails, you can just plain avoid touching your iPhone. Use a rubber band to attach it to your head, leave it speaker phone, use a headset, use the included earbuds, or learn to levitate it. It's an awful solution, but it's there as a very last resort. These pseudo-solutions that we're offering aren't exactly elegant in most cases and might not work all the time in others. They're not intended as a bulletproof answer to whatever reception issues your iPhone 4 is experiencing, but they're a temporary way of living with the problem. We'd love to hear how they work for you—if you've tried them—or about any alternatives you may have found useful.